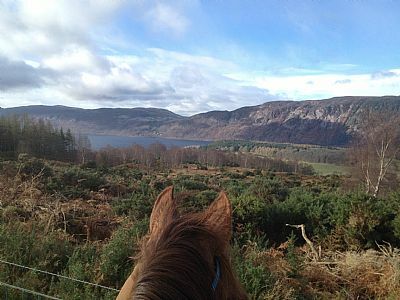 Loch Ness Riding (fully approved by the British Horse Society and the Horses Welcome scheme and licenced by the Highland Council) takes experienced riders for hacks and lessons, either privately or in small groups. I am sorry but we do not take beginners. Riders should be competent and balanced at all paces - English style - no jumping required! Our weight limit (depending on what horses we have avaialable is around 15st or 100 kg.. No children under 14 unless by special arrangement. We can do day rides and trail rides of 2 or more days as well as shorter hacks of 1,2 and 4 hrs. Riding holiday packages are available - see our page "Riding Prices". We offer qualified instruction in dressage, jumping, stable management, western riding and training horses. Endurance riding is a speciality. Qualified instruction can be given on your horse or ours. Regular competitions are held at the centre in all disciplines. Loch Ness Riding is one of only 3 centres in Scotland approved by the BHS to train students to BHSII level. We also host BHS assessments. Our horses are Arab, Irish/Welsh Sports Horses, TB, Anglo Arab and cob. We have an indoor school and outdoor arena plus some XC fences. 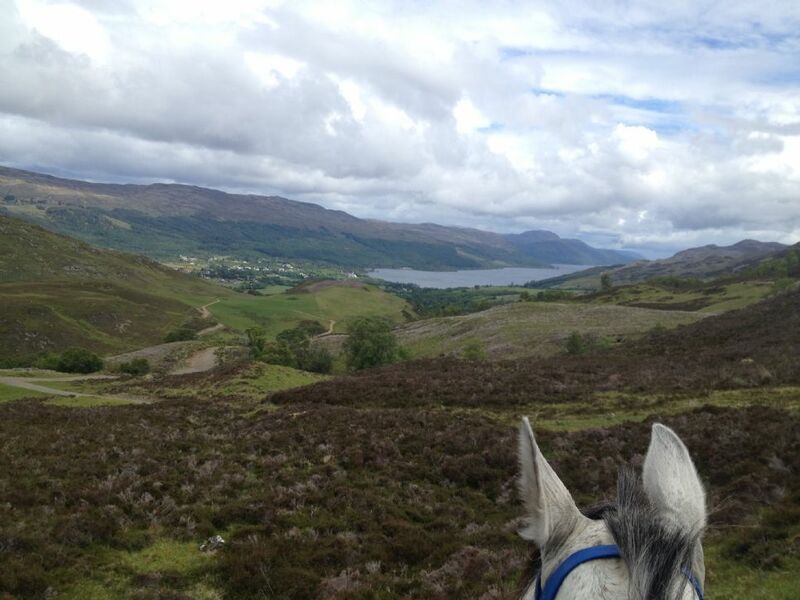 We offer spectacular off road hacking and are located on the 50 mile loop Trail of the 7 Lochs. We are more than happy to make provision for you to take photos on your ride but we do not allow the use of Go-Pros or similar. We are 10 miles SW of Inverness which takes about 15 - 20 mins by car. We are based near Dores on the east side of Loch Ness at the north end of the Great Glen. To find us from Inverness, take the B862 from Inverness to Dores then bear left uphill in the village (still on the B862). Go up the hill for about 1 ½ miles then turn right just past a steading conversion on your right – signed to Loch Ness Log Cabins and Drummond Farm. Loch Ness Riding is the first property along that road on your right (just after the wind turbine and big shed). The stables are beside our house. It may be possible to pick you up from the bus stop in Dores with advance warning.